With the completion of the 2016/17 collaboration between the Health Design Lab at Emily Carr University and the Pacific Autism Family Network the teams experienced a second successful year of working together. We succeeded in our aim to gain a better understanding of how researchers and families currently communicate, and to foster ideas for improving future communication and knowledge exchange. At the grand opening of the GoodLife Fitness Family Autism Hub in Richmond in November 2016 we created an interactive installation consisting of two components: a vision wall and a live bar graph. Over the course of 4 days hundreds of visitors to the new facility participated in our installation. For the vision wall participants were encouraged to write down their vision on a paper hexagon and add it to a wall display. Yellow hexagons began with the prompt, “I hope…”, while green hexagons began with the prompt, “I need…”. For the live bar graph participants were asked to take a rectangular piece of paper and place it above the category that they felt best answered the question, “Where do you access ASDs research?”. The categories provided were: web search, MCFD, other families, clinicians, service providers, research journals and other. In January 2017 we facilitated 4 2-hour workshops. Three of the workshops were held at the Richmond PAFN hub, and one was held in Prince George. In total 45 people participated in these workshops, with approximately 10-15 participants in each session. Within this participant group 26 were caregivers/family members of individuals on the spectrum, and 20 were researchers/service providers. Each workshop included four activities: introduction/warm up, string mapping, interviews and final group discussion. We utilized design methodologies, which enabled a multidisciplinary approach for creating and developing knowledge and empathy between the designers, researchers and families engaged in this project. 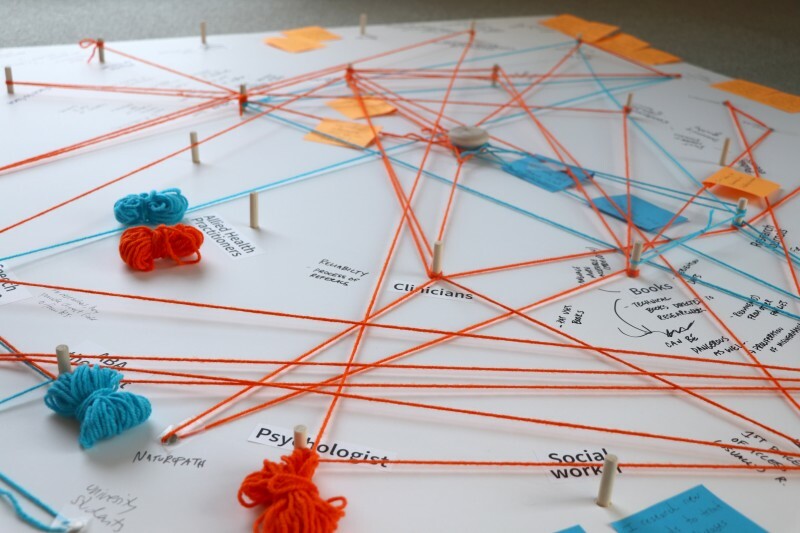 In the Health Design Lab we use generative methods, including co-creation to enable participants to express their thoughts, feelings and needs, through verbal and visual means. We design objects or artifacts that act as triggers for conversation to help foster dialogue and draw out latent and tacit knowledge from participants. Through the workshops we gained insights into the way families and researchers currently navigate and share information; we gained an understanding of the barriers to information exchange within the ASDs community; and we gathered ideas to improve future access to ASDs resources and research. The next step identified for the 2017/18 school year is to co-design and prototype a web-platform. The goal of the platform is to facilitate knowledge exchange and support research users (families and self-advocates) in making informed decisions based on best-practice research and to enable researchers to connect with families to support their research endeavors creating direct linkages and ongoing connectivity with the ASDs community. This web-platform project is being jointly funded by PAFN and Emily Carr University. This project is also a recipient of the first MSFHR Reach Awards. Read all our collaboration reports here.